Euxoa olivalis is a small to medium-size Euxoa (FW 12–16 mm) with streaky gray-brown or brown forewings with a bar-like orbicular spot crisply outlined by black and light gray and filled with brown that flies in steppe and forests east of the Cascade summit during early and mid-summer. The forewing ground color is light yellowish gray-tan, heavily suffused with warm brown surrounding the cell and along the veins in the posterior median and subterminal areas to the point where the wing appears to be brown. In some specimens the distal subterminal area opposite the cell and in the teeth of the W-mark on M3 and CuA1 is light gray. The cell is filled with dark brown, and the costa in the subterminal area and the terminal area are dark gray. A black basal dash is present. The veins along the costa, including the radial vein, and the cubital vein are light gray to the postmedial line, while the other veins are black. Twin black spots mark the origins of the antemedial and postmedial lines on the costa. The antemedial line forms a brown and black "V," apex pointed lateral, at the base of the claviform spot and is obscure elsewhere. The median line is absent. The postmedial line is very faint, dark gray, scalloped on the veins. The subterminal line is light gray or tan, slightly irregular with a moderate W-mark on the mid-wing. It is preceded by a dark gray shade on the costa and a series of long black wedges between the veins on the mid-wing. The terminal line is black. The fringe is gray, finely longitudinally striped, with a tan base. The orbicular and reniform spots are outlined crisply in black outer and light gray inner lines and are filled with the ground color. The orbicular spot is bar-like, nearly horizontal, extending to near the reniform spots in most specimens. The reniform spot is C-shaped, often obscure at the lower end by the pale cubital vein. The claviform spot is black, small to moderate-sized, narrow, filled with brown. The hindwing is light whitish gray-tan with slightly darker gray on the outer third, with barely darker discal spot, veins, and terminal line. The hindwing fringe is white with a light gray base. The head and antenna are gray-tan to brown, with a black line across the mid-collar and powdery light gray edges to the tegulae. A frontal tubercle is present. The male antenna is biserrate. Euxoa olivalis is placed in the large subgenus Euxoa. 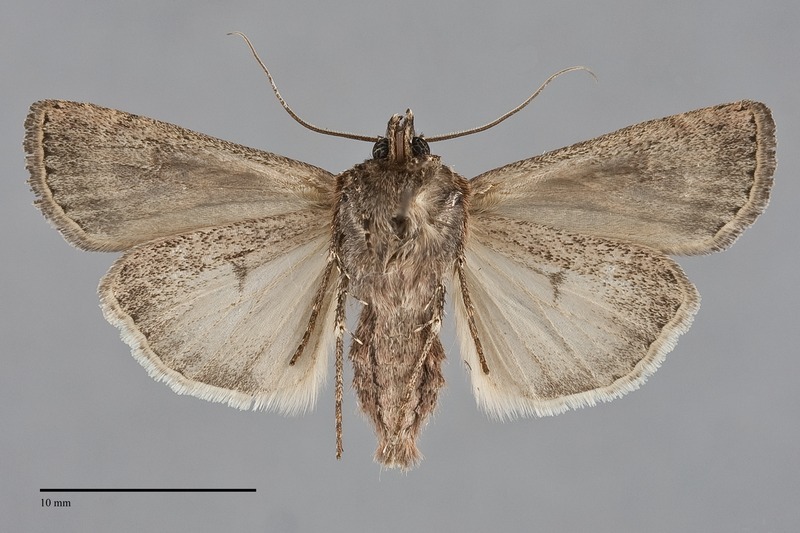 This moth can be recognized as one of three similar Euxoa species by its brown color, streaky pattern with light gray veins on the costa and framing the dark cell, and bar-like orbicular spot. It is difficult to distinguish from two similar species, Euxoa agema and Euxoa oblongistigma. Euxoa agema is found with E. olivalis but prefers more mesic forests, typically at moderate or high elevations. It is more uniformly brown, with less gray streaking on the distal wing and along the veins, and has a thinner orbicular spot in which the brown filling is often reduced to a thin line that is as narrow as the black outline. Euxoa oblongistigma prefers open sage habitats and usually flies there later in the season than E. olivalis. It is smoother gray-brown than E. olivalis, especially along the pale costa, and has an orbicular spot that is filled uniformly with light gray rather than containing dark filling, and a lighter hindwing with a well-defined gray marginal band. 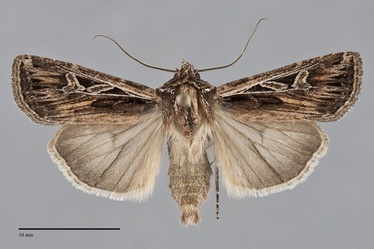 Males of Euxoa olivalis have long saccular extensions that bend dorsally around the "heel" of the cucullus, which can be observed after brushing the scales from the tip of the abdomen with a fine brush, while those of both of the other species are slightly shorter and end near the heel. Populations of E. olivalis that fly early in the summer in steppe habitats can be confused with Euxoa melura. This species is more uniformly brown-gray without warm tints. Its orbicular spot is a shorter oval, rather than bar-like, and this spot and the reniform spots are more widely separated than in E. olivalis. Similarly, the narrow orbicular spot separates E. olivalis from two uncommon species in the subgenus Orosagrotis, Euxoa ridingsiana and Euxoa maimes, both of which have nearly round orbicular spots. 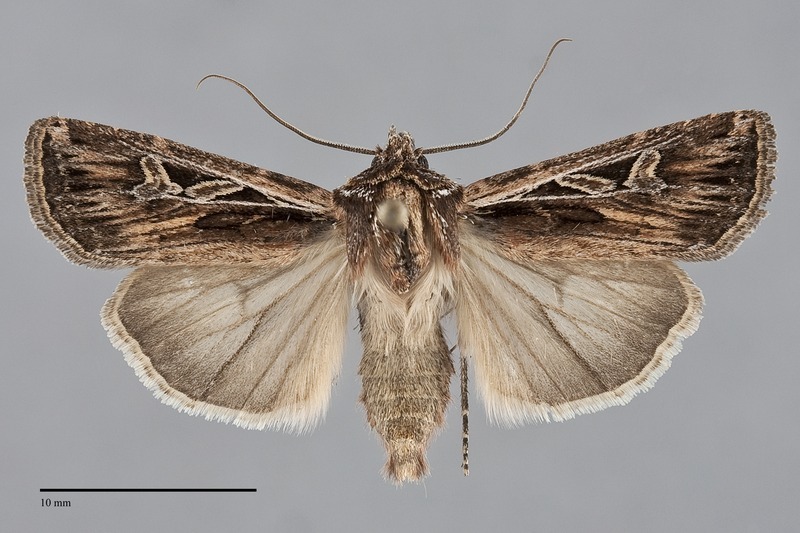 This species is widely distributed in arid rangeland habitats throughout much of western North America, including short-grass prairie on the Great Plains and sagebrush steppe west of the Rocky Mountains. In the Pacific Northwest, it is usually uncommon to moderately common on dry, open sagebrush steppe at low elevations east of the Cascades, but is usually rare and sporadic in juniper woodlands and ponderosa pine forests at middle elevations in Oregon. It is more common in dry forests than in steppe habitats in Washington. Unlike the closely related E. oblongistigma, this species was more common in sagebrush-juniper habitat that was burned over in a wildfire compared to adjacent unburned habitat, so this species appears to benefit from fire disturbance. Euxoa olivalis is found east of the Coast and Cascade Ranges in the dry interior regions of our region. They occur in steppe habitat near the foothills of the Cascades but are most common in dry forests. The range of this species extends east across southern Canada to Saskatchewan. The southern limits are northern New Mexico, Arizona, and southern California. A disjunct population occurs in southern Yukon Territory (Lafontaine 1987). Euxoa olivalis flies during the summer from early June to the end of August. The earliest records are from low elevations. It is most common during the months of June and July. It is nocturnal and comes to lights.